On April 17, 1964 the Ford Motor Company introduced the Mustang at the New York World’s Fair. To say it was an instant hit would be an understatement. First conceived as a two-seater sports car in 1961, by the end of 1962 Ford vice president Lee Iococca outlined his vision for the car, code named T-5: it should seat four people, be no longer than 110 inches, cost under $2500 and have plenty of options for growing Baby Boomers as well as mothers looking for a second family car. The result was what Ford advertising described as “the car you design yourself.” Iococca and Ford had created the “pony” class of automobile, a small car like a sports car but with a long hood and shorter rear deck. Since the car was intended to please coming-of-age Baby Boomers — the first car to be designed with this generation in mind — as well as families looking for a second car, one of the top innovations of the vehicle was the variety of options for engine, transmission, drivetrain, interior and exterior trims. Buyers could outfit the car like a plain, practical small family car or customize it with a high-performance package that brought it to muscle car status. It came in a coupe or convertible style, with a starting price of $2368. The cost was kept lower by basing the car on the Ford Falcon frame and drivetrain. After projecting sales of 100,000 units for the first year, Ford sold 22,000 Mustangs on the first day, and reached the one millionth sale just 18 months later. The car’s popularity spanned the generations, as boomers, young families, people looking for a practical second car and older people all fell in love with the styling. Why wouldn’t they? There was nothing else like it on the road. Mister Boomer does not recall the first time he heard about the Ford Mustang. As a pre-teen himself, it was probably from the TV commercials that Ford had blanketed the airwaves with during the Mustang’s inaugural week. It could have just as easily been on the pages of Look or Life magazine, as Mister B’s family had subscriptions to both. He, like other boomer boys, thought the car was cool, but it was when Brother Boomer bought a used Mustang that Mister B felt a visceral connection to the car. Brother Boomer bought a 1965 Mustang in the summer of 1968. As soon as he pulled into the driveway, the car gleamed with its Silver Blue metallic paint. It had a 289 cubic inch engine with a 3-speed manual transmission, a white vinyl interior and white vinyl top. Mister Boomer’s brother spent every spare second polishing every nook and cranny of that car, from waxing and polishing the car and chrome bumpers to the Pledge he used on the white vinyl interior. At twilight the effect made the car glow as if it had a light all its own. That was it; Mister B was smitten. Brother Boomer further tricked out the car by dropping in a 4-speed and having the 2-barrel carburetor rejetted so it was the same as a 4-barrel. The distributor and timing were customized as was the suspension and exhaust. Chrome reverse wheels replaced the standard (already cool) Mustang hubcaps. Brother Boomer raced it at a nearby dragway on summer weekends, ultimately winning a trophy for his division. 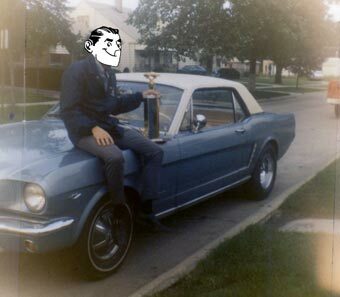 Brother Boomer sits on his used 1965 Mustang, circa 1969, holding the trophy he won for racing the car. It was a great car to be seen in, despite the bumpy ride experienced in the back seat. The 8-track tape player installed in the glove compartment added to the joie de vivre. It was also the first car Mister B rode in on a double date. His brother had invited him to a double date to the drive-in theater. The year was 1969, and Mister B found a date willing to go. The two couples rode to the drive-in, Brother Boomer behind the wheel and his date (who ultimately married Brother Boomer) in the bucket seat next to him, while Mister B occupied the back bench seat with his date. Once they arrived in the theater and parked the car, Brother Boomer asked Mister B to switch with him. Mister B had finally gotten the chance to sit behind the wheel of this cool Mustang, but the car was parked, with a speaker box hanging from the driver’s side window. His date was now a bucket seat away, with a gear shift in between them. In the end it didn’t matter, as the movie they went to see was Bob & Carol & Ted & Alice, as impressionable a movie to a teenage Mister Boomer as when his brother took him to see Thunderball four years earlier. Mister Boomer’s sister also had a Ford Mustang. She got Mister B’s father to co-sign a loan for a 1966 yellow fastback model with a black vinyl interior somewhere in the early 1970s. She only had the car a year and a half when a motorcyclist plowed into the side of the car, hastening its demise. Mister B finally had a chance to own a Mustang after he was out of college and working full-time for a couple of years. For his first new car, Mister B bought a 1977 Mustang hatchback. Mister B loved the car, but unfortunately, it was a lemon. Within four days it was back in the dealership, with issues ranging from loose oil pan bolts to needing parts in the distributor. Since the car was new, the parts hadn’t even been issued yet, so it was a good thing Mister B hadn’t sold his old Ford for that first month. The car was in the shop six times in the first year alone, so by 1979, he traded it in. Despite the setbacks, Mister B would definitely own a vintage Mustang today if he had the funds. What memories of the Ford Mustang come back to you, boomers?